The SHANKARACHARYA NYAS and MITTRA FOUNDATION are hosting an evening, DIL DHOONDTA HAI dedicated to Madanji at the Shankaracharya Sankul Hall, Nashik on Sunday, 14 April 2019. The 3-hour event will feature the screening of an exclusive film A JOURNEY THROUGH HIS TIMELESS MUSIC, curated by his son, Sanjeev Kohli, only for select tribute events. 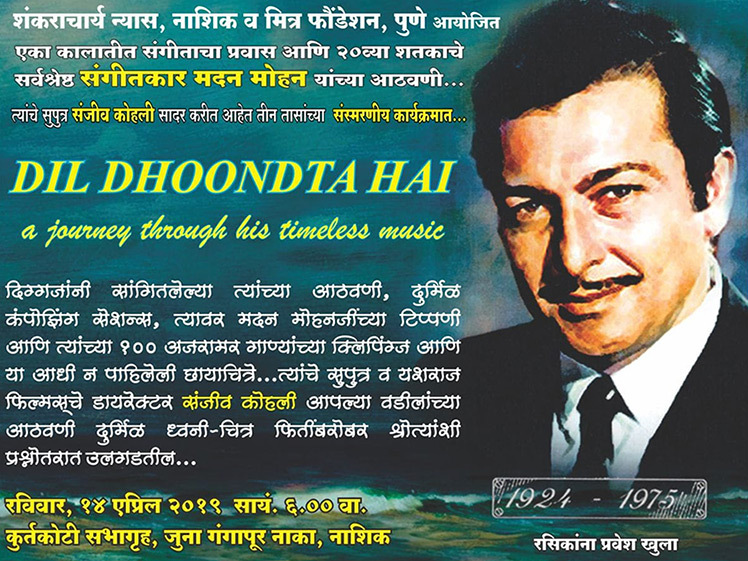 The screening will be followed by a Q&A session on the musical legacy of Madanji shared by Sanjeev Kohli, though his personal and heartfelt memories and rare audio-visual presentations.